Tim from Gleaming The View came out to give me an estimate on gutter cleaning and power washing my driveway. 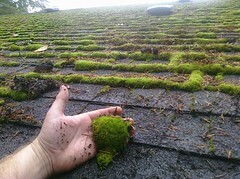 While it is still some weeks before all the leaves around my home finish coming down, I had recently had my roof replaced and there were some clogs already in my gutters I was worried about. I thought Tim was just going to do an inspection and then give me the quote, but he said his goal is to always leave the customer with no clogs, so he used his pressure washer to unclog every one of my gutters as he was inspecting them to verify where they drained out to etc. He did not charge me for this; he said it was just part of the inspection, and gave me a quote on the cost to clear the gutters later this fall after the leaves were all down ($140). Needless to say, I was very happy with this “above and beyond” approach to customer service, and I will happily call him to clear my gutters when the time comes. I will also call him again in the spring when it’s power-washing time.